I was looking in Cabelas today and saw they have a bunch of pietta SAA 1873 model revolvers as low as 400 new. Is the reliability and such of the pietta going to differ from the Uberti to justify spending the money on ubertis or even rugers for a beginner? I'm a Ruger fan the Vaquero and New Vaquero are the toughest revolver in this game. The Pietta and Uberti offerings are good too but 1873 technology can only take you so far. Spend a little more on the Rugers and cry once. But try everything you can before you buy. It's good advice and you will hear it often. I shoot both Uberti's and Pietta's. The Pietta's are smoother right out of the box and built better. One GW2 I have has more than 10,000 rounds through it and I've had zero problems. My Uberti's have had to have some parts replaced, mainly the trigger bolt spring and hand with spring. The Alchemista by Pietta is a very nice pistol but runs a tad more than the standard GW does. Now if you want a virtually unbreakable pistol, go with the Ruger's. I had Ruger's but never could get used to the feel of them, so I sold them and now shoot the other brands. Try out everything you can get your hands on then buy what feels best for you. I think he's saying it's like Ford or Chevy. Uberti and Pietta the two Italian SAA copy makers both make a fine revolver and it may come down to personal preference. Try as many different guns as you can before you buy. 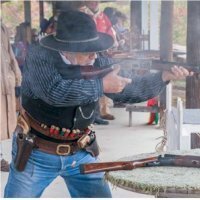 Go to a local match most cowboys and cowgirls are very proud of there guns and are very likely to let a new shooter try them out. USA made with great C/S. Maybe, just maybe, some day, Ruger will make 44-40s. Until then, I am stuck with Uberti as the best option. Heck, I would settle for 38-40 Vaqueros if Ruger made another run of them. I am shooting Cimarrons currently, these are Pietta. No issues with these. Smooth as can be out of the box with a sweet trigger. Ford or Chevy. Your money. My perspective on the SAA's is from a gunsmiths view. Not what they cost or how well they retain their value. Purely from the mechanical perspective. If you want tuff out of the box, Ruger is the way to go, but I don`t consider it to be a clone. The ruger lock works were designed in the 1950's. It is nothing like the colt style lock basically unchanged since 1836. Comparing Rugers to a colt SAA or Colt SAA clone is like comparing 60`s muscle cars to model T`s. Like the sixty's muscle car the Ruger does well right out of the box. The colt style guns need upgrades much like dropping the small block in the Model "T". The good news is many of the current SAA's come with some of these upgrades. The Pietta's and the Uberti now have the Ruger style coil spring update. The Pietta's come with the better bolt and hammer geometry so they tend to not go out of time as easily as the others. The Pietta's also comes with hardened firing pin bushing. This prevents the firing pin hole from washing out in the frame. The Pietta screws are the same as Colt, too. The ruger is the most durable for this game but it does not feel like the old SAA. My perspective on the vThe current colts are good guns too, but a few years back I had issues with some of the 3rd gen colts so I'm a bit gun shy toward colts. If their QC stays at current levels I may change my mind. Really do agree 110% about your comparison of Rugers to the rest of the field. Ubertis have consistently had good quality and were tied to Colt, USFA and AWA when they were bringing guns in to complete. Thee have minimal quality hickups in the past decades. I mostly shoot a brace of OMVs now. They are built like tank. When I shot clones, I carried a spare pistol to matches. I do not carry a spare Ruger, no need. I'm with Nate Kiowa Jones. I don't address cost, retained value. Just from a mechanical standpoint. Nate has been working on em a mite longer than me, but after 16+ years working on CAS guns, I do consider the offerings from Pietta to be the better value for dollar. Pietta also take less work to set up for CAS than Uberti. I don't consider Ruger as a Colt reproduction (I hate the term "clone"). It is a separate category. Regardless, they ALL need some attention to be considered "match ready." There aren't many if any Colt guns being produced at present. Well overpriced for what you get. Of those two. Right now I would go with Pietta. Nice guns by a company that has stepped up to support our young shooters like no one else has. Not only giving pistols away to our young shooters. But paying there entry fees into EOT. They have stepped up. So go support them if between those two. I got a set of Pietta's a while back. Could not be more pleased. I agree with you OLG, they are the best bang for the buck and durable as all get out. But like I said, I had Ruger's and they never felt right. I shot them for 2 years and finally went with the others because they feel and balance better for me. Not everyone likes the feel of them, so a lot of us shoot the other ones that do. A friend of mine who already owns Ruger and Uberti revolvers purchased a pair of the Piettas from Cabelas. He said he could not pass them up at that price. He immediately took them to a local gunsmith for a little more slicking up. I'm looking forward to seeing them in action. These Piettas came with a transfer bar ignition and a frame mounted firing pin. Other Piettas have a more traditional Colt style action. Some people may like that and some won't . Uh-oh, if these have the T bar conversion I might be inclined to pass. Historically the makers that have added T bars/frame mounted firing pins to the SAA type actions haven't had good luck with those parts holding up. The Hammerli with the hammer block, the "D" cam Uberti's, the Taurus Gauchos, the EAA Bounty hunters, the Colt Cowboys and the Beretta stampedes come to mind. They all had issues. Some worked but many didn't. "T" colt type guns ,sneak away a few feet then run like "H" away from them !!! pietta has had some much lager issues ( guns from 2005-2009 especially C&B ) When given more than ample chance to set things right have steadfastly refused to do so.... The answer after much Hounding, "they are with-in acceptable manufacturing tolerances "
Gotta agree with OLG about the 60's Cobra. I have a clone.